The upcoming Overwatch map set in Paris was a welcome surprise for more than just the fact that it’s a new map with (hopefully) some lore teasers thrown in. Namely, the existence of a fully functional piano in the map has been stealing most of the attention away from the rest of the map — and for good reason! 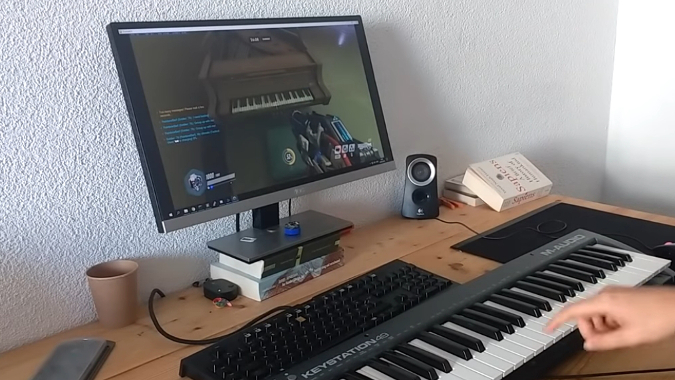 Not only is the piano leading to all sorts of in-game masterpieces being created, it’s actually led one player to create a Python script allowing you to use an actual, real-life keyboard to play the in-game piano. Check it out below. Please note: The code used to make this happen is technically an AimBot. While it’s certainly fun and amusing to watch, it’s not recommended you try this yourself unless you want to risk being banned. When asked on Reddit about how they made it happen, user zbone said it was done using a “PianoAimBot” script they made in Python, and that the script allows you to play songs in real time (like the above) or load and play MIDI songs. Of course, zbone also notes — Ha! Get it? — that you need to be positioned in a specific location for this to work. One also assumes the script was designed specifically with Soldier: 76 in mind, but other heroes with similar firearms might also work. Outside of just generally being really freaking cool, this setup has the advantage of speed that would be almost impossible to pull off without an AimBot. When it comes to playing songs with faster tempos, it’s pretty difficult to actually aim properly and fire fast enough to get the song to sound accurate. For example, zbone also uploaded this video of them playing the French National Anthem (to Widowmaker, fittingly enough). It’s worth the watch on creative use of emotes alone. The piano playing is just the cherry on top. It’ll be interesting to see how distracting the piano becomes once it’s off the PTR and on live servers. Given the basketball in the starting zone of some maps isn’t distracting beyond the first few seconds before a match begins, hopefully the piano will be the same. Then again, the piano doesn’t have the same gravity-defying physics or inaccuracy the basketball has. Maybe we’ll just have to get used to losing because the Genji player was off trying to figure out how to play “Never Gonna Give You Up” on piano.